RELEASED Parashara's Light 9.0 (Windows) is available in English, Hindi, Gujarati, Marathi, Bengali, Kannada, Tamil & Telugu Parashara's Light 9.0 (Mac) is now available in English, Hindi, Gujarati, Marathi, Bengali, Kannada Tamil & Telugu. Anka Jyotish in English, Hindi, Gujarati, Marathi, Bengali, Kannada & Telugu. Vedic Vaastu is available in English, Hindi, Gujarati, Marathi, Bengali, Kannada, Tamil & Telugu. It features a wealth of calculations, charts, tables, and interpretive reports. It is the ultimate and the most innovative Vedic Astrology Software for mobile phones & tablets! . Traditional Vaastu for Modern Builds! 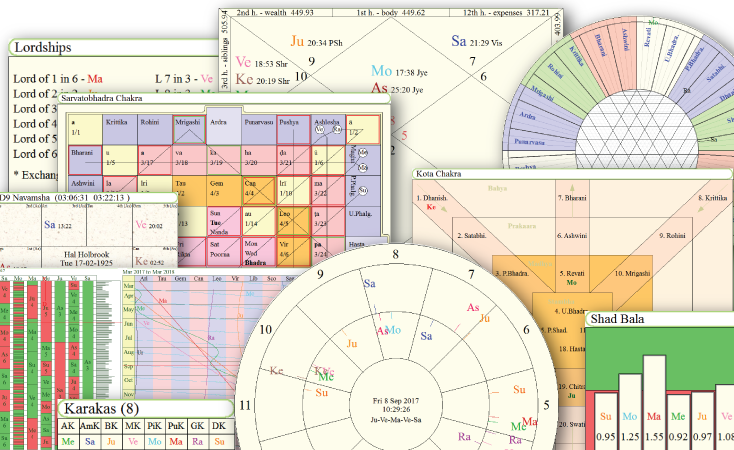 Anka Jyotish software is for predictions based on numerological calcuations. Vedic Bookshelf is a classical Vedic Library at your fingertips. Automatically finds the most favorable time and date for any occasion. 1. Full compatibility with windows 10 (32 bit and 64 bit), with sharper graphics and touch screen support. 2. Many changes in timezone and daylight savings dates from recent years– the world is changing and we move along! 3. The new, fully up to date ephemeris will give you more accurate calculations for recent years, and enormous historical range (4700 B.C. to 5400 A.D.). 4. Fully unicode compliant giving you more flexibility to use modern day fonts. 5. When searching for Muhurtas, the update offers important protection against accidentally giving out wrong times. 6. View instant and personalized insights for interpreting planets and houses, without popups or distracting windows. 7. Support for True Chitrapaksha Ayanamsha. 8. Many new calculations: Bhrigu Point, Mandi, Magnitude of planets, bhavapada calculation etc. 9. Sarvatobhadra Chakra is a unique tool for predictions based on Nakshatras. Enhanced Anka value interface. 10. 10. Kota Chakra differentiates more sensitive nakshatras with less sensitive nakshatras so that effects of transit of planets in various nakshatras on the health and happiness of a person can be studied. 11. Sanghatta chakra helps identify periods of Arishta (misery, mishaps etc.). 12. Instantly view the effects of the various new chakras for any past life event. 13. Show 7 Karaka report with seven or eight columns. 14. Support for new varga charts viz. Astottaramsa etc. 15. Support for Tithi Pravesha & Local Tithi Pravesha charts. 16. Support for Dasha Pravesh charts. 17. Support for Book size printing. Now Parashara's Light has support for file, book and pocket size printing. 18. Direct support for printing to PDF. Now print to PDF directly from Parashara's Light without relying on third party tools. 19. New Dasha system added viz. Padanadhamsa. 20. Additional chara dasha options for advanced users. 21. Dasha cells now also show current age for immediate reference. 22. Support for Pushkar Navamsha. 23. Support for calculation of Rahu Kala. 24. Option to show (hyperlinked) karakas in degree chart. 25. Support for direct scrolling through dashas and timelines. 26. Several new features added to Chart & Table selection viz. Ghat chakra, Avakhada chakra, new timelines etc. 27. View applicable yogas side by side with the chart, and see them change when you change the time of birth. 28. Show report content on worksheets making it extremely convenient to view interpretations with chart and other calculations. 29. See all sign transits for a year at a time, uniquely arranged around the chart. 30. See all transits for a quarter or for a year in a fascinating graphical format. 31. Improved printing of worksheet, and superb control over layout and graphical design. 32. Drag and drop worksheet cells, and resizing of charts and tables to any size. 33. Better support for large monitors, tablets and notebooks. Worksheet can accommodate upto 30 charts & tables. 34. Set any worksheet to be your “home” screen and many more enhancements! 35. Incorporate your favorite image(s) or logo on your screen and printouts. 36. Excellent support for taking notes, specific to a person, or general notes. 37. Improved support for rectification with a highly configurable setup. 38. Change time toolbar, allowing you to change the time of birth or muhurta without popup screens. 39. Many new interactive screens with interpretive content from the reports. 40. See the current dashas in the animated transits screen. 41. Highly enhanced Calendar feature which is now fully customizable. 42. Click on days in a monthly calendar to instantly see all the muhurta charts and relate data for that day. 43. Powerful design features allow you to design screens to an amazing degree, graphically and content wise. 44. Optional Top Toolbar that gives access to all screens organized by category. 45. Click on any house, planet, sign, nakshatra and many more points for more info without blocking the screen. 46. Step through time to view effects of transits according to various techniques and dig deeper with a single mouse click. 47. Highly enhanced search for Chart features. 48. Control scaling of fonts in charts & tables. 49. Improved Model printing interface. 50. Startup screen gives a handy snapshot of current planetary positions along with Nakshatras. 51. Printable Panchanga time period extended upto 2035. Copyright © 2007-2018, Parashara Software Ltd.